Ref: Policing in Lancashire 1839 to 1989 by Bob Dobson, Landy Publishing 1989, ISBN 0 9507692 7 4. Preston police force was formed in 1815 and was amalgamated into Lancashire County Police force in 1969 when it had 283 policemen. In 1835 the Municipal Corporation Act forced boroughs of a certain size to have their own police force and in 1839 the County Police Act was enacted to bring in police to rural areas around towns. The first HQ of Lancashire Police was 7 Stanley Terrace off Fishergate hill although several offices were later set up in Preston and it isn't clear which was the HQ. 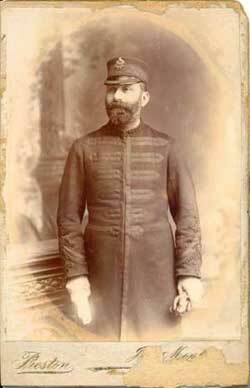 Photo of one of my Great Grandfathers, an inspector in Preston Police around 1910. 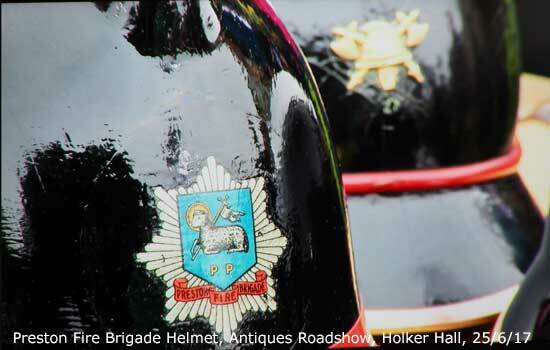 Preston Fire Brigade Helmets displayed at BBC Antiques Roadshow, Holker Hall broadcast on 25th June 2017. 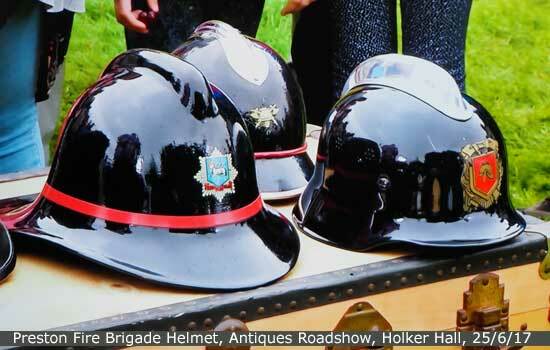 Firemen's helmets are made of cork or paper to stop electrocution.